Microsoft founder Bill Gates told a Reddit audience on Monday that his new role at Microsoft will be to envision "ambitious scenarios"--which apparently encompass how operating systems, as well as data, will be shared among various Microsoft devices. 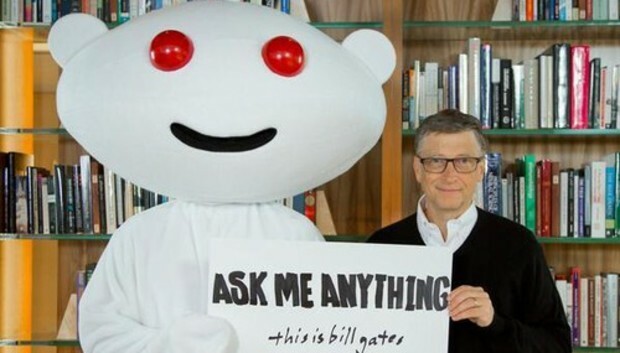 As he did a year ago, Bill Gates took to the virtual pages of Reddit for an "Ask Me Anything" session, which encompassed everything from his most guilty pleasure to the differences that he's noticed in himself over the last 20 years. Naturally, the most important question was the one about Gates' new role: as a technology adviser to new Microsoft chief executive Satya Nadella. As the company's former chairman, Gates has obviously continued to work with Microsoft employees, and he was reportedly instrumental in Nadella's selection. But even though Gates will devote just a third of his time to Microsoft--with the remainder to the Bill & Melinda Gates Foundation--his role at Microsoft represents his first, public, hands-on role in some time. So what will Gates be doing, exactly? "I make sure we pick ambitious scenarios and that we have a strong architecture to deliver on them," Gates wrote. "I encourage good work (hopefully)." A new take on "cloud first?" Specifically, Gates said, more work remains in making sure both data and programs roam across devices, part of the new "mobile first, cloud first" mantra. "I am excited about how the cloud and new devices can help us communicate and collaborate in new ways," Gates wrote. "The OS won't just be on one device and the information won't just be files--it will be your history including being able to review memories of things like kids growing up. I was thrilled Satya asked me to pitch in to make sure Microsoft is ambitious with its innovation. Even in Office there is a lot more than can be done." Gates also pointed to "deep learning" as the field in which he recommended young computer-science majors specialize--and what would change computing over the next decade. "The ultimate is computers that learn. So-called deep learning which started at Microsoft and is now being used by many researchers looks like a real advance that may finally learn. It has already made a big difference in video and audio recognition--more progress in the last 3 years than ever before." In this sense, Gates wrote, "learning" is less about machine learning, or interpretation, and more about actual comprehension. While Gates wasn't perhaps as specific as he could be, what he suggests points to a future where Microsoft's various operating systems possibly blur together--in a way which some have suggested Windows RT and Windows Phone combine. There's also the intriguing possibility that in suggesting that your history include "memories of things like kids growing up," that Gates believes Microsoft should actually do something with its social-networking experiment, So.cl. Gates also weighed in on a number of other topics. "This is a complex issue. Privacy will be increasingly important as cameras and GPS sensors are gathering information to try and be helpful. We need to have trust in the way information is protected and gathered. There is a role for the government to try and stop crime and terrorism but it will have to be more open. I do think terrorism with biological or nuclear weapons is something we want to minimize the chance of." Just creating an innovative company is a huge contribution to the world. During my 20's and 30's that was all I focused on. Ideally people can start to mix in some philanthropy like Mark Zuckerberg has early in his career. I have enjoyed talking to some of the Valley entrepreneurs about this and I am impressed and how early they are thinking about giving back--much earlier than I did. Owning a plane is a guilty pleasure. Warren Buffett called his the Indefensible. I do get to a lot of places for Foundation work I wouldn't be able to go to without it. 20 years ago I would stay in the office for days at a time and not think twice about it--so I had energy and naivete on my side. Now hopefully I am a bit more mellow but with a little extra wisdom. This is a sensitive topic. The idea was that men don't like the current design so perhaps something they would be more open to would allow for less HIV transmission. We still haven't gotten the results. One grantee is using carbon nanotubes to reduce the thickness.